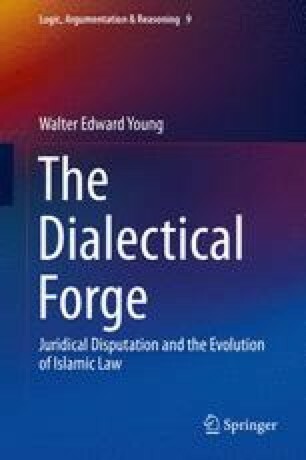 In this chapter, “A Picture of Proto-System Jadal,” all the findings of preceding analyses are summarized under categorical headings, placing the whole of the subject-text’s dialectical elements in contradistinction to those of the jadal-theory lens-texts surveyed in Chap. 4. These are grouped according to what is more consonant with full-system theory (7.1), and what is more unique to proto-system teaching and practice (7.2), then followed by a host of additional elements from non-sequence arguments (7.3). Ordered listings of the subject-text’s unique question and argument modes, and distinctive formulae of subsumption, extension, and objection, support several of the study’s core theses: there were, indeed, “proto-systems” of both juridical dialectic and legal theory; detailed portraits of these proto-systems emerge through lens-text analysis; and there are clear, genetic relationships between proto-systems and full-systems. Certain elements of wider historical interest are then listed (7.4), and the chapter closes with a few brief remarks on the overall character of proto-system juridical jadal (7.5).